My curvy sisters! What's with the deathly fear of stripes and high-waisted pants? We can rock 'em like nobody's business. Key to this trend --> cinch in the waist and pair with heels to elongate the body. Flats with this style of pant can make you look "dumpy"....like my mother would say. Tank, Joe Fresh. Pants, American Apparel. Belt, I have no idea. Sunglasses, Aldo. Shoes, Joe Fresh. wow lovely shoes! LOVE them! I invite you to my FB PAGE - you can paste on the wall link to your blog :) All fashion lovers invited! and by the WAY I LOVE YOUR COUNTRY, it is my fav, I wish I would be there for 3-6 months, we want to trip someday there with my boyfriend, he because of downhill biking - there are the best trials in the world! i love your outfit. you really rock it well! Sooo adorable, I love these pants on you. They look really great on you with that cute striped tank. Yup you totally rocked these pants! Oh, you look gorgeous. Of course I love the outfit, but I think the sunnies really give it a great touch! Nice! by the way, are you following on google connect? i didn't see your picture pop up! You totally rocked them girl! Love the color of the pant and the shoes! very nice outfit, now I wanna get a pair of high-waisted pants. Really cute outfit, make me wonder of summer! Fabulous pants! Love the colour! The outfit is amazing! I love the pants! refreshing blue ensemble! 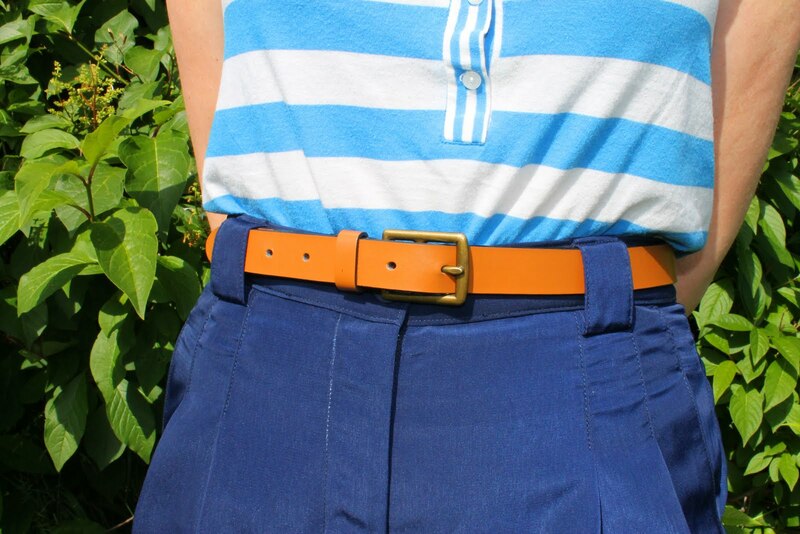 the pop of mustard belt is so stylish!